Air ducts are an integral part of any HVAC system. It is through the air ducts that hot air or cold air flows into the rooms of a house. Thus, one can well understand the importance of air ducts in an HVAC system and if the ducts are dirty, chances are high that unclean air will get inside the rooms. Hence, air duct cleaning is of prime importance in order to prevent polluted air from entering the house. The rule of the thumb with regard to air duct cleaning is that if they look dirty, they are dirty and needs to be cleaned. However, HVAC experts are the best persons to judge whether air ducts of an HVAC system needs cleaning or not. To ensure the indoor air quality: The indoor air quality is of prime importance in a building. This is because it is this air that the occupants of the building breathe in. If the quality of the indoor air is not that good chances are high that it will aggravate certain health conditions like allergies or other breathing problems. With dirty air ducts, the probability of poor quality indoor air increases which in turn may not be conducive for certain health conditions. Thus, it is necessary to keep the air ducts of an HVAC system clean. 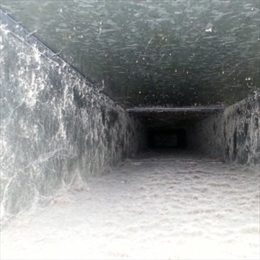 Another reason as to why one must clean air ducts is that it promotes energy savings. When the HVAC systems are dirty whether it is the ducts or any other component, it is obvious that the appliance will have to work harder in order to produce the desired cooling. This will cause unnecessary strain on the appliance. As a result, more energy will be wasted causing high electricity bills. On the other hand if the HVAC systems are clean, they will run with less effort and the energy bills will be kept under control. At the same time, duct cleaning can also increase the life span of a typical HVAC system because a clean system means lesser wear and tear on the appliance and if there is lesser wear and tear on the appliance, the HVAC system will run for long without much difficulty. The next question that comes in mind is that what must be the frequency of air duct cleaning in an HVAC system. There are several factors that affect the frequency of duct cleaning. For example, if there are smokers in the house, pets or residents with breathing difficulties, the cleaning must be more frequent. Similarly, after renovation of a home and before occupying a new home, one ought to clean the ducts of an HVAC system. This will keep the system free from all unnecessary pollutants. As far as the time required for duct cleaning is considered, it depends on the type of house, the accessibility to the duct work and the number of workers who are involved in the project. However, a standard time required would be something around four to eight hours.